This entry was posted in Uncategorized and tagged affirmations, Buddhism, meditation, Patanjali, positive thoughts, Thoughts, Yoga, Yogi Bhajan, Zen. Bookmark the permalink. 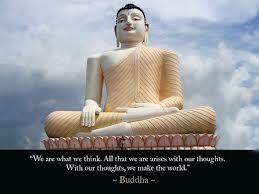 thanks Donna, your blogs are always great, I do not read all that often, but the quote on the Dhammapada drew me in.